One of the best known exploits of the Essex Regiment was the capture of the French Eagle at the battle of Salamanca. 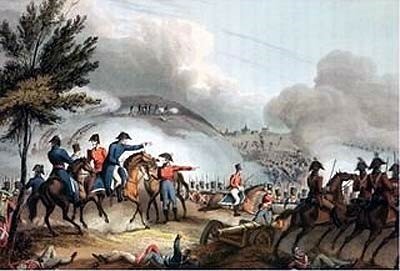 The battle of Salamanca in 1812 followed swiftly on the capture of forts at Ciudad Rodrigo and Badojoz during which the Essex played a prominent roll and spirits were high. The British army freed the town of Salamanca and then withdrew to the nearby heights awaiting the arrival of French Forces commanded by Marshall Marmont. Over the next two weeks the armies movies in the countryside around Salamanca with both trying to get into an advantageous position. On 22 July 1812 Lord Wellington felt that he had the advantage and ordered and advance thus starting the Battle of Salamanca. The 44th Regiment was attached to the Fifth Division which formed the centre of the British line. As battle joined the 44th section line of battle coincided with a small area of woodland , which meant that the two lines were only a few yards apart before each became visible. Fortunately for the British the French line at this point was engaged in a change of formation and the British seized advantage by firing a volley and then charging. Lieutenant William Pearce and Privates Finley, Murray,Blackburn and Devine of the 44th Regiment together with Lieutenant Francis Maguire of the 4th Regiment and Ensigns John Pratt of the 30th Regiment surprised a small group of French soldiers. Not only did the 44th win their battle but the British Army as a whole scored a resounding victory. The Eagles was kept for the night in the regimental Quarter Guard. Lt Pearce divided 20 dollars between the Privates as a mark of his appreciation of their gallant exertions in supporting him. On the march for the next day the Eagle was carried by Lt Pearce as a mark of honour until it could be presented to Lord Wellington. Lt Pearce achieved the rank of Lieutenant -General and was make KB in 1913 although he was always known as the man who took the French Eagle at Salamanca. Private Finley was promoted to Sergeant. A strange footnote to the battles is that a second eagle was taken that day by Major Crookshank of the 38th Regiment although this was removed from the dead on the battlefield rather than in battle and as such did not receive the same renown as the eagle captured by the 44th Essex.